For many purposes a light webserver is good enough. This page looks into running httpd from busybox with php and sqlite. The following actions will be explained below. Create a directory as document root. As an example, create the directory /var/www and put some html-documents into this directory. This will run httpd in the forground. Because of the -vv switch messages will be displayed here. Now open a webbrowser to the ip-address of your machine and check the messages. 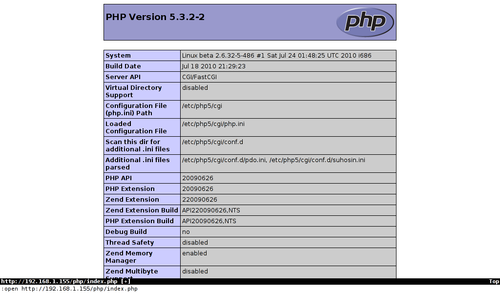 Put php5-cgi in /usr/bin and make sure the needed libraries are installed. If ldd is not installed, then find out which libraries are missing by running /usr/bin/php5-cgi on the commandline. Create a test.php-file with phpinfo in it. Stop the httpd if it is still running with Ctrl-C and restart it. Now point your browser to the test.php file. If the webserver does not show something like this but throws an error message, then check the messages from the -vv switch. Now change your startup script to start the httpd at system start. Put something like the following line in your startup-scripts. Now that our webserver is up and running and is able to parse php scripts, it is time to add a database to the system. In many cases we don't need all the power that comes with MySQL. SQLite is a great alternative in those cases. First we make a testfile testdb.php with a small script that creates a database and a table, puts some data in the database and retrieves it. Stop httpd if it is still running. See the messages to check everything is OK. If everything is working OK, kill the webserver and start it without the -vv and without the -f switches. The instructions above where used to create a lightweight LXC container. The container system is based on busybox with dropbear. The busybox httpd is used as an webserver. This is great for light usage (like developing php applications. Busybox and dropbear were compiled from source while php5-cgi and the needed libraries were copied from a Debian installation.